I remember it like it was a lightning bolt, my then mentor said to me: “Your opponent is your partner, not an enemy!” I thought that statement was blasphemous! My entire competitive life, I viewed the opponent as my enemy, someone whom I must defeat. The entire goal was decimation! My mentor, Jena Marcovicci, was a former tour player who learned this lesson the hard way like most of us. What I didn’t realize is how this approach hurt me. It made me tight because there was only one acceptable outcome … winning every point, game, set and match. Additionally, it completely took the focus off my process, my game and what I could control. While shifting the focus to something I couldn’t control, the outcome. Okay, so stay with me, I know you still want to win and so do I! But, let me explain … there is another approach and the goal of winning is still the same. However, this approach will allow you to shift the perspective and approach in competition to being your best and playing in a calm, more relaxed and aware manner. How about looking at your opponent as your partner and even extending it out to the court conditions. What do I mean by this? Both your opponent and the conditions are there to challenge you. They are, in fact, there to make you better, hone your game and make you mentally more resilient. Isn’t that the objective? If not, play a three-year-old the next time. I promise that will get old real quick! 1. 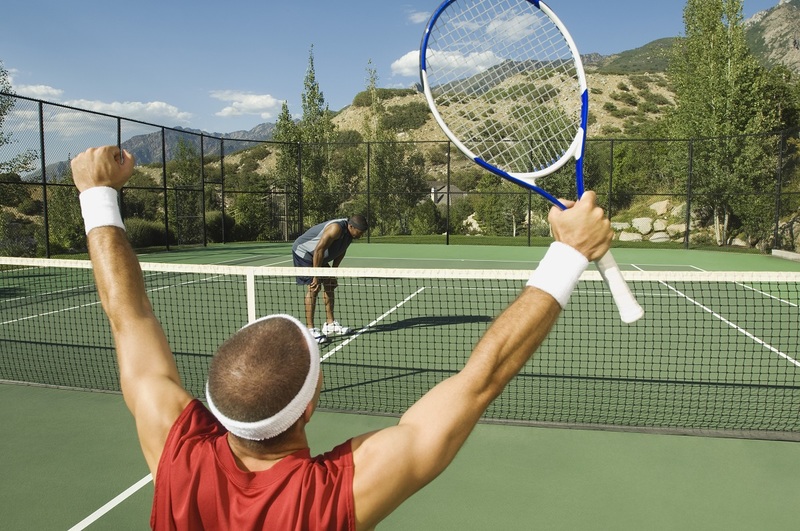 Open vs. close: As Jena said in his book, The Dance of Tennis, “You will neutralize the fight or flight mentality than can cause you to rush or over hit a ball, hesitate or lose your cool.” Rather, you will play from a place of being centered, making good choices, sound strategic decisions and focusing on your game. You will no longer be playing from a place of crisis, high alert, and fight or flight. You won’t be out of breath because you lost a point. 2. Allow vs. force: When you allow, you will play from a less frenetic place. Not only will this be easier, but will eliminate the need to hit that ESPN highlight reel shot! You will be more apt to work the point, knowing it’s not just about your shots, but also about how your partner plays the point. When players “allow,” they play within themselves without forcing. 3. Respect vs. no respect: This one is my favorite, again, really …? You might be wondering how can I suggest respecting the opposition? It comes down to the singular premise: If there weren’t an opponent, there would be no one to challenge you. In fact, if you respect them, your job is to beat them and “show” them what they need to work on. So yes, don’t go easy on an opponent, beat them 0 and 0! An aware partner will recognize where and what they need to practice for the next time. Conversely, if you lose 0 and 0, thank your opponent for showing you what you need to work on. Also, get their number and thump them the next time. 4. Play present vs. play in the past/future: When your focus is on the process, you are taking things step by step. Your focus is on what you can control and need to do to best compete and adapt to situations. If your focus is solely on beating the opponent, something you cannot control, you won’t see the court, detect momentum, make percentage choices and stay patient. Rather, you will just try to aggressively hit “your” winners, no matter what is happening. 5. Win vs. lose: Yes, you will win more because you are able to play from a more relaxed, calm and centered place. You are no longer looking at your opponent as an enemy that must be beat. More so, now it’s about being your best, bringing you game, and competing your best. However, if you don’t win, you will gain valuable feedback on what needs to be worked on in your next practice and match. So go out, crush your opponent, respect them and their game. By doing so, you will improve yours, and no matter the outcome, you win! Rob Polishook, MA, CPC is the founder and director of Inside the Zone Sports Performance Group. As a mental training coach, his focus is on the athlete as a person first and recognizes the strength of being “More” than an Athlete. Through this lens, he is able to help athletes be their best version of themselves both on and off the field. His best selling book Tennis Inside the Zone- 32 mental training workouts for champions is sold nationally and internationally. He has spoken at USTA, USPTA, ITA conferences, and has conducted workshops India, Israel and the Omega Institute. His work has been highlighted in ESPN’s 30 for 30 series, Sports Illustrated , NY Times and other media. Additionally Polishook is an adjunct Professor at Seton Hall University. He may be reached by phone at (973) 723-0314, e-mail rob@insidethezone.com, or visit www.insidethezone.com.